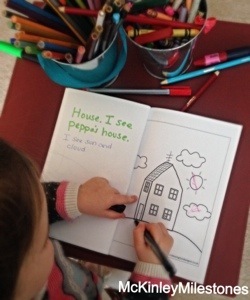 My efforts to distract yet another tantrum led to the making of a coloring book. My toddler begs to watch Peppa Pig. So much that one time I made the mistake of making it a reward for taking a nap. And now, sleep = Peppa. Television was actually something I did not tolerate for over the first year of her life. “No screen time what-so-ever,” I would tell people. But, then life happened. Taking care of my dad in the end of his life was way more important than being a screen time drill Sargent. 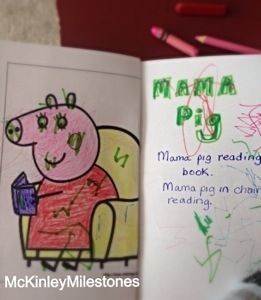 And so, she became familiar with Curious George and Peppa Pig. McKinley starts begging to watch Peppa pig and it’s 10am. “No Peppa right now,” I say. “Later today.” The tantrum slowly begins. 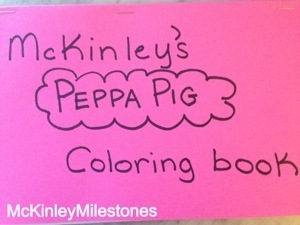 “How about we color Peppa instead?” I ask. Diversion complete. 1. 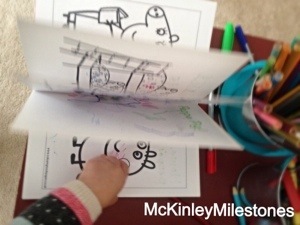 Look on Google images and let them pick out and point to the photos they want to color. paper (2 pictures per page). 3. 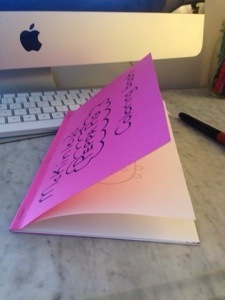 Stack all printed pages and place a piece of colored construction paper on the bottom. 5. Staple along the edge. The great thing about doing this project is it’s quick, easy, and fun! Also, you can make different coloring books as their interests change. Happy 21 months to McKinley today!